I've installed Qt, but I'm getting errors when trying to debug C++ code from within QtCreator. I'm using Visual Studio 2017 on Windows, and it seems like the debugger that QtCreator needs (cdb.exe) is not installed. How can I configure debugging to work for 64-bit code within QtCreator when using the MSVC2017 compiler? I've tested these steps on both Windows 10 and Windows 7 (x64) and it seems to be working. Note that the version of QtCreator that comes bundled with the Qt installer is the 32 bit version, and it won't work out of the box if you're trying to do debugging using MSVC. 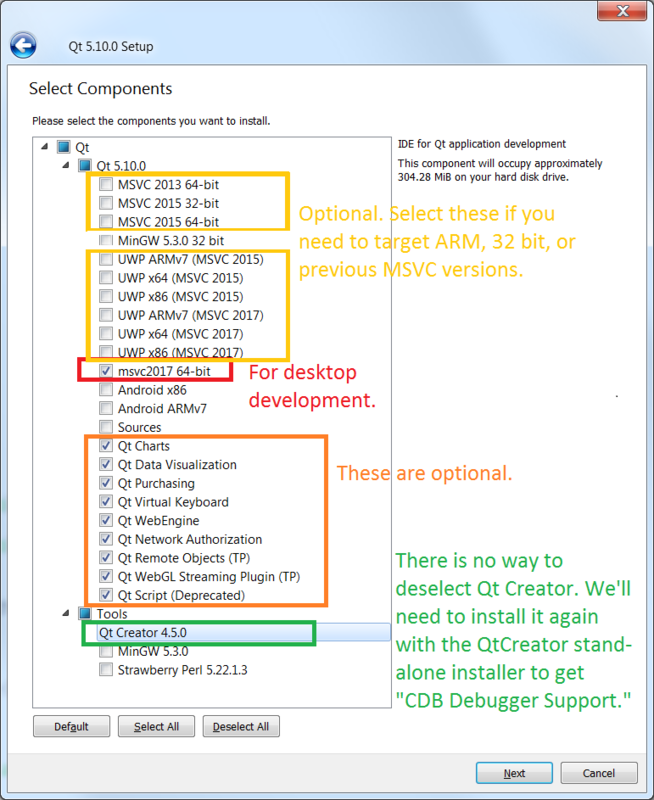 This is documented, but not step-by-step (see QtCreator Windows Debugging and QtCreator Debugger Engines), and not everything is in one place, so I'm going to provide simple instructions here on how to get things working for the reference system I describe above. Assuming you have Win7/Win10 and MSVC2017 installed, let's get started! Install with the option "msvc2017 64-bit" checked. 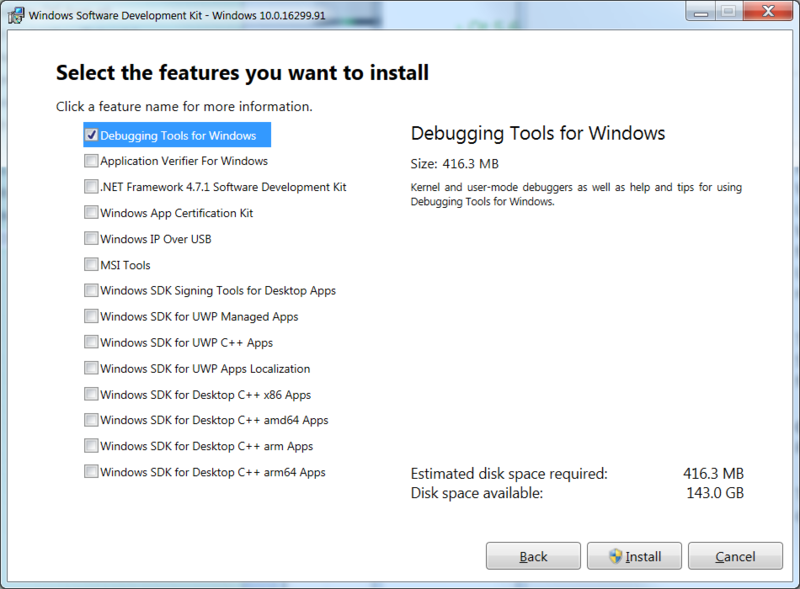 The web installer will download the selected component and create a folder called "Windows Kits." NOTE: if you install QtCreator AFTER installing the Windows debugging tools, QtCreator will automatically detect the location of the debuggers, saving you the hassle when creating the kits. If you have already installed QtCreator, don't worry, configuring the kits in QtCreator is shown below. 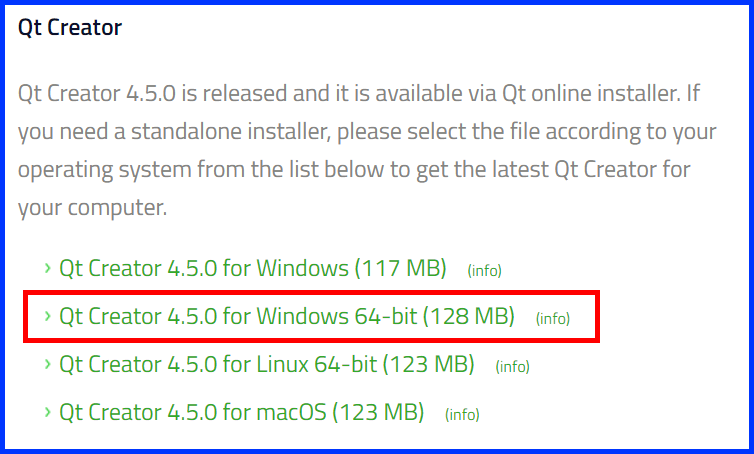 Download "Qt Creator 4.5.0 for Windows 64-bit"
In QtCreator parlance or terminology, a "Kit" is a combination of debugger + compiler + Qt version + others. (In this sense, the word "Kit" does not mean the same thing as it does for "Windows Kits" when we installed the debugger above; this is an unfortunate name collision.) Set up a "QtCreator Kit" by selecting Tools -> Options -> Build & Run. I like to start on the far right tab and work to the left, ending on "Kits." The reason for this is that all of the tabs (1,2,3) below need to be configured in order to make a complete Kit. Set the path to C:\Program Files (x86)\Windows Kits\10\Debuggers\x64\cdb.exe and give it a name like "Window Kit 10 cdb x64". Set up the compiler. 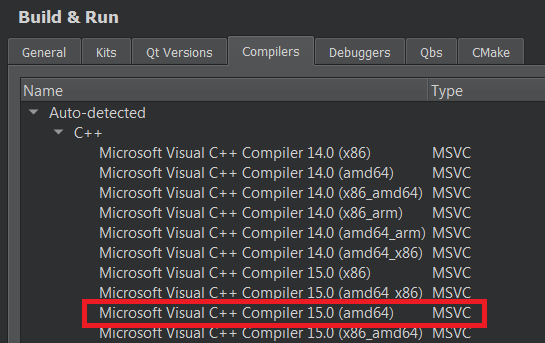 Make sure "Microsoft Visual C++ Compiler 15.0 (amd64)" is in the list. Note that QtCreator will auto-detected these locations if you've installed things to the default paths. Add the path to the compiler if it isn't listed. Note that for Visual Studio 2017 x64 bit, you want the "amd64" version, which is the 64-bit compiler. In case you are wondering why there are so many compilers listed--they are "cross-compilers." That means they target different architectures, so for example, the "x86_amd64" is a 32-bit process that creates a 64-bit application; you would use this version if you were developing 64-bit code on a 32-bit computer (hence the term cross-compiling). Since this tutorial assumes you're running on a 64-bit OS, use the amd64 version. (The "x86_amd64" cross-compiler will also generate 64-bit code.) 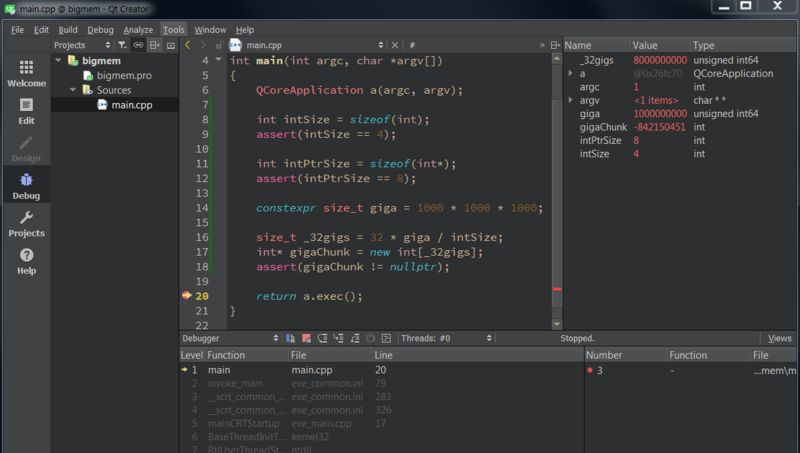 When I first saw the huge list of compiler selections in QtCreator, I didn't know which one to pick. Now you know, too! See When compiling x64 code, what's the difference between "x86_amd64" and "amd64"?. Name - Give the name of the Kit; this will be the configuration you use when compiling your application. 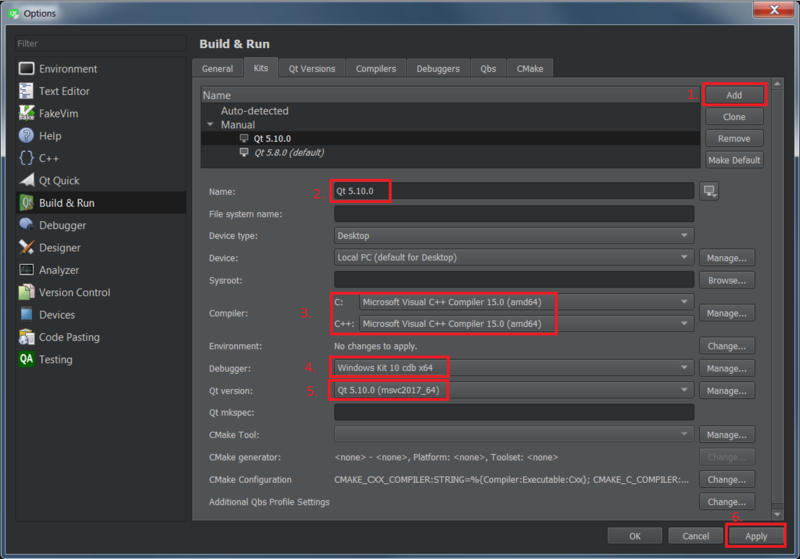 Compiler - Select the "Microsoft Visual C++ Compiler 15.0 (amd64)" for C and C++. Qt version - Select "Qt 5.10.0 (msvc2017_64). It is important to compile with the same bit-ness as the Qt libraries that you will link against. Note that I'm using the MSVC2017 64-bit compiler and the CDB.exe debugger mentioned above. Not the answer you're looking for? Browse other questions tagged c++ qt debugging visual-studio-2017 qt-creator or ask your own question. How much memory can a 32 bit process access on a 64 bit operating system? When compiling x64 code, what's the difference between “x86_amd64” and “amd64”? 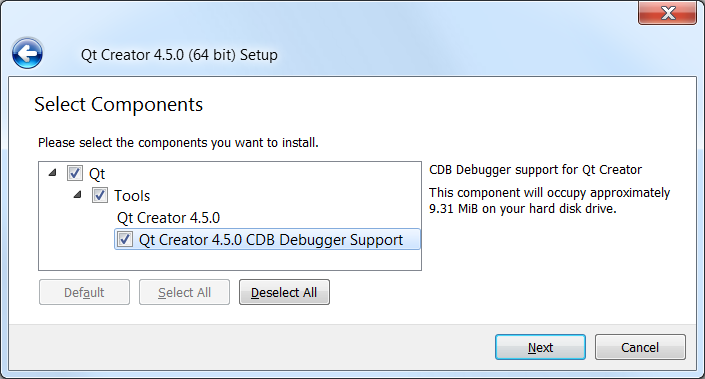 How to configure CDB in Qt Creator? How to use QtCreator on Windows to build and debug applications for Linux? Why do I need CMake for a qMake Project at QtCreator?